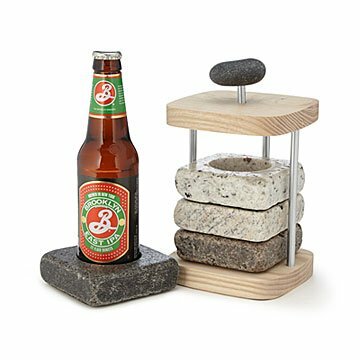 Prepare this stone coaster set in your refrigerator or freezer, and then carry the caddy to the table for a naturally chill round of beer or soda. Handmade from reclaimed New Hampshire granite, the substantial coasters employ the chillable quality of stone to keep your beverage bottles cold and securely upright. Each one is a different variety of granite, so sippers can easily identify their bottles. When you lift your drink, the robust coaster will stay where it belongs instead of sticking to the bottle and the cork-clad bottoms prevent table scratches. The ash wood and aluminum caddy keeps the coasters securely housed and the sea stone handle makes it easy to tote. For every natural stone they gather, makers Arra David and Anne Johnson "replant" a new stone to be tumbled in the ocean over time. Coasters have a 2.5 inch diameter opening that fits most tall 12 ounce bottles. Handmade in Windham, New Hampshire. Please note the item has changed to a Rounded shape. Store coasters in the freezer for at least thirty minutes prior to using. Coasters can be expected to keep beverages chilled for approximately thirty minutes. Coasters when Stacked in Stand: 5" L x 5" W x 8.5" H, weighs approx. 6.36 lbs. Great product for beer lovers. I was very excited about finding this and giving it to my brother in law. I knew he'd love it. Only problem was, it wasn't quite what I was expecting when it arrived. I thought these were a solid piece of granite, but they actually have a 'hole' in the bottom that is covered with a flimsy piece of cork. My nephew almost stuck his finger through one. I was very disappointed. There was nothing in the catalog or in the packaging, to describe why this feature. That would have been so helpful. My husband actually looked impressed when he unwrapped this gift, only to be disappointed his beer bottle didn't fit; also it will not fit standard beer cans. He instantly wrote it off in his mind as useless. The use is SO limiting because the diameter is too small. I don't think it will even hold most glassware. Also the cork bottom is very thin, I don't expect it will last long if we ever do get use out of the coasters. I am having a friend enlarge the holes with his grinder in hopes they can actually be of use. It doesn't fit even 12 oz bottles! We have tried several brands of canned and bottled beer and nothing fits. Such a disappointment. After seeing the set, I will be ordering one for myself. Brother-in-law loved it! Great gift! This product was an awesome gift for my brother-in-law who is a beer lover! Great quality! This is a great gift, especially for that person who is hard-to-buy for or who has everything. The idea is great, however this does not fit many drinks including beer bottles. So now it's a really heavy item that takes up space in my freezer. Would not buy again.